Belmont’s Public Relations Student Society of America Chapter attended the annual National Conference, held this year in Atlanta. The chapter was among several to receive the Star Chapter Award, recognizing excellence in 10 categories including community service and ethics advocacy. Belmont PRSSA is one of only two chapters in the nation, out of more than 300, to receive this each year since the award was established in 2009. 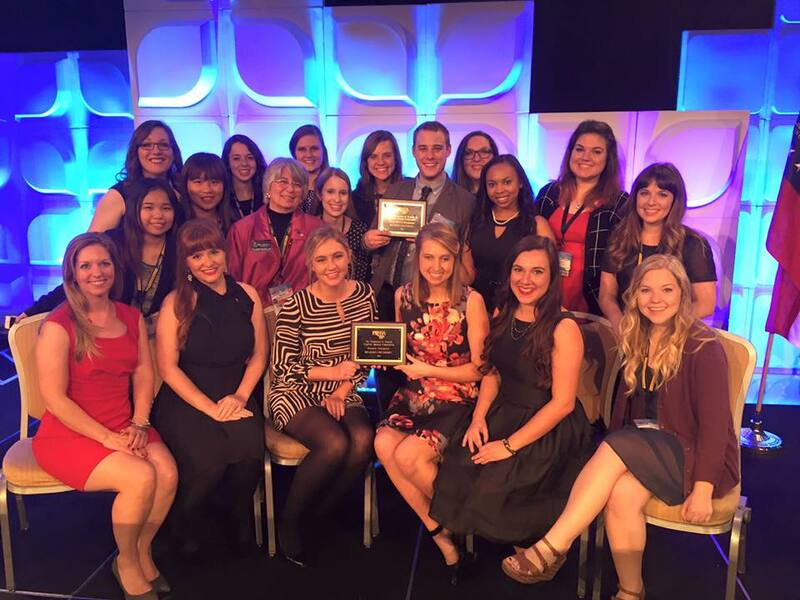 –The PRSSA Teahan Outstanding Regional Conference, recognizing the NASHvantage conference hosted in March, attracting more than 200 students from 28 universities. This is the second time winning this award, after winning previously in 2012. –The PRSSA Teahan Outstanding PRSA/PRSSA Relationship Award, recognizing the sponsoring professional chapter, Public Relations Society of America Nashville Chapter, for its financial and mentorship support, as well as the students’ engagement with them. Belmont previously received this honor in 2007. Additionally, Belmont’s past PRSSA president and current National Vice President of Advocacy Victoria Lewis received a PRSSA National Gold Key Award and a PRSSA President’s Citation for contributions to the organization.